Regular, standard bagels are typically made with refined, junky white flour and void of nutrition. To make matters worse, they’re dense and usually weigh in at about 450 calories, and that’s before you even consider any of the toppings you spread on. Instead, my skinny bagel is a cinch to make and packs 10 grams protein, 4 grams fiber, plus vitamins and minerals for just 140 calories. One delicious deal! Combine flour, baking powder, chia seeds and salt and mix well. Add the yogurt and mix until all of the flour is incorporated into a dry batter. Knead the dough with clean hands until its dry and elastic (this will take about a minute). Then, divide into eight balls. One at a time, roll each ball in your palm and form into one long rope (if it breaks apart, just squish it back together). Lay each on the parchment paper and form into a circular shape, cinching the ends to complete a closed bagel. Mist tops with oil spray and then add seasonings (sesame seeds, everything-but-the-bagel spice, poppy seeds, chia seeds, sesame seeds, cinnamon spice, etc). Bake for about 25 minutes. Let cool before slicing. Note: These freeze wonderfully. When ready to enjoy, simply thaw in the microwave, slice and toast in the toaster oven. Alternatively, you can slice before freezing, and place in toaster directly from the freezer. Nutrition information for 1 bagel. 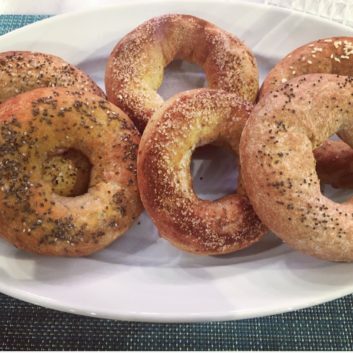 Love these bagels? Try my Cinnamon Raisin Protein Bagel for a little variety.